Bad Credit Payday Loans (UK) - Instant Decision - 97% Approval rate. Apply Now For An Instant decision With No Obligation & No Credit Check. On average Swift Money® approve over 97.5% of all payday loan applications. Bank loans can be virtually impossible to get if you have bad credit. Where else can you turn if you need money in a hurry? Swift Money®, where our very high acceptance rates of up to 97% result in all applicants being extremely likely to be accepted, regardless of their credit score. Almost all of us have been in a situation where money was tight, where your cash runs out just a couple of days before you get paid, and you need money quickly to pay a bill, to buy petrol, or even just to eat. Some people are lucky enough to be able to borrow from a friend or family member, and some can rely on a bank loan or overdraft for the cash they need. These avenues have their own problems. It's not always feasible or desirable to borrow from friends or relatives, and banks have such strict loan requirements, that getting a personal loan is very difficult. The biggest stumbling block for most people who want to apply for a short term loan is their credit score. Either it's too low, meaning that if they are eligible for a loan at all, the interest rate is likely to be prohibitively high—or they don't have a credit history at all. A person's credit history is a reflection of the debts they've incurred and their track record when it comes to paying them off. If a person's credit score is low, banks are wary of providing loans, due to the risk that they might default on the loan. And if someone doesn't have much of a credit history at all, because they don't have a credit card, for example, banks are equally wary, because there are no indications that they're able to manage debts responsibly. In both situations, your credit score affects your ability to get a personal loan, and it also affects how much interest you pay on a loan if you do get one. What Are Bad Credit Payday Loans? Bad Credit Payday loans typically range from £50 to £1000. These loans are granted to applicants with low credit scores in exchange for repayment on the next pay date with a small interest charge added. 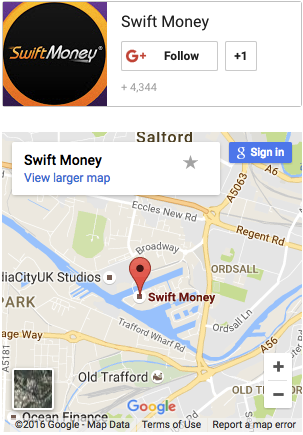 Getting a payday loan with Swift Money® is easy. Just apply online, providing details of your income and expenses, submit your application, check your email and receive money in your bank account! It doesn't get any easier than that and it's the same simple process even if you have bad credit, because we don't use your credit score or credit history as criteria for deciding whether to grant your loan, or what kind of interest rate to charge you. Note that although we call them payday loans, and most people use these loans to keep them going until payday, you're not under any obligation to use your loan for this particular reason, it's your loan and there are almost no restrictions on what you do with the money. However, the amount you can borrow is partially dependent on how much you earn, so you do need to provide proof of income when applying for payday loans for bad credit. And, of course, you don't need to have bad credit to qualify for a Swift Money® payday loan. Our payday loans are for everyone, no matter what their credit score might be. But often, it's a poor credit score or a lack of credit history that prevents people from getting a personal bank loan when they need one, and if you find yourself in this situation, we might be able to provide a solution to your financial problems. No matter what your credit history is, you can apply for a loan with Swift Money® right now, and be approved on the same working day. We've provided this service for more than 250,000 people in the UK and we're happy to help you too!